← To Truly Celebrate the “4th”; May We Suggest You Participate at St Petes!! VIRGINIA BEACH – Believe it or not playing shuffleboard has become a trendy pastime north of Florida. Ashish and Livia Patel happened across the game while living in Brooklyn and got hooked on it.Now they’ve brought their passion to Virginia Beach in the form of Beachside Social, a 10,000-square-foot facility on the second floor of 2728 Atlantic Ave. (the old Viking Hotel) where there are six regulation sized shuffleboards, a bocce ball court, food, a full bar, and a great view. “We lived in Brooklyn close to a similar place,” said Livia, who is herself still a few decades away from retirement age. She had never heard of shuffleboard, but the couple went and watched others play. Eventually they started playing, joined a league, and loved it. She said they did really well, actually going undefeated. “It was a great atmosphere and was really surprising the number of young people that were interested in it,” she said. Beachside Social opened June 25. Thanks to a wall lined with large windows overlooking Atlantic Avenue (and even the ocean) the space is light and bright and feels as much like being outdoors as being in. The ocean/beach/nautical theme adds to the cheerful atmosphere. The full bar serves craft beer, wine, and signature mixed drinks. From the kitchen comes flat breads, sliders, and other food choices. For the time being Beachside Social is opening at 4 p.m. daily and employing 19 people. But when their hours expand, she said, so should the workforce. Brief instructions are offered to those who are not familiar with the game and the rules are posted. However, there are no TVs or screens of any kind in the place. “We want to make it as socially interactive as possible. 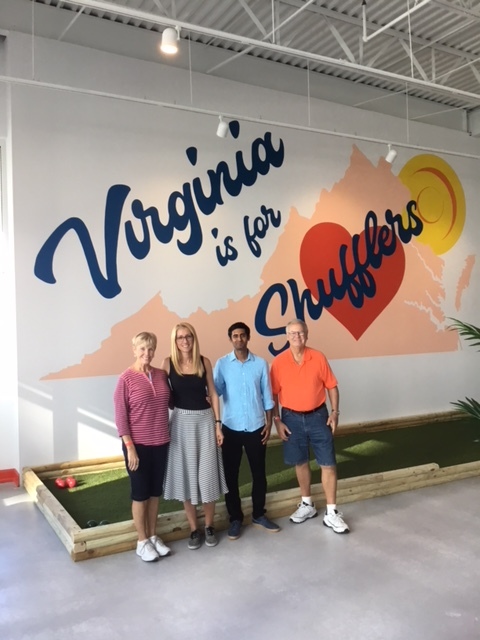 Sometimes people just want conversation and personal interaction,” said Livia, who also serves as the president of the Virginia Shuffleboard Association while Ashish is a state delegate to the USA National Shuffleboard Association. Although they’ve just opened and are still getting their feet wet, the couple hopes to start leagues that would run in the fall and winter, offering an alternative activity for area residents. While the shuffleboard courts need to be rented ($30 hourly), people-watching is free, as are the board games that can be checked out and played while waiting for a court. The Patels think they will benefit not only from the summer tourists, but also all of the people who come to town for events at places like the Virginia Beach Convention Center. They’ve begun reaching out to neighbors and the community and have already had several inquiries from those interested in renting the facility for private events. “It’s definitely a great activity for someone who wants to do something different,” Livia said. Fabulous article Stan. Thank you. We really want to promote this club. Thanks for coming to our soft opening Joyce and Bob! Looking forward to promoting shuffleboard in Virginia Beach with you! I feel the excitement in your voice Livia…….While talking with you on the phone. Thanks very much, Myrna! We look forward to have you try out our courts!